Our 110-acre facility in Fredonia allows children to experience and embrace the outdoors. In addition, camp provides plenty of tented areas for shade throughout the program day. Pre-planned rainy day schedules and hot day schedules take advantage of indoor space. No matter the weather, every day is a blast. Creating a comfortable and safe aquatics program is one of our most important goals. We provide daily American Red Cross swim lessons for all campers K5-5th grade. Campers are swim-checked based on their ability, placed in the appropriate swim group, and rechecked frequently throughout the summer. POOL: The Daniel M. Soref Aquatic Center is accessible for campers of all abilities. This newly reimagined facility incorporates a shallow area, deep end, and splash pad with adjacent locker rooms. 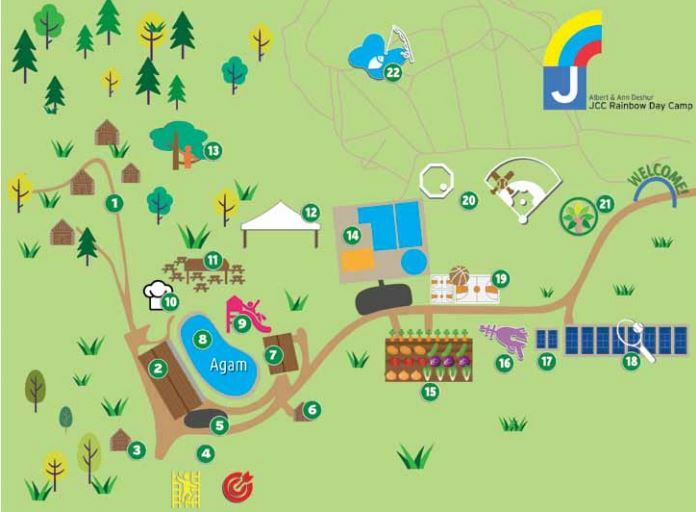 AGAM: The Agam is a spring-fed pond that provides campers with boating and small craft experiences as well as an inflatable obstacle course and slide.